Mediterranean design style reflects a distinctly relaxed and inviting atmosphere with its colorful touches, rustic furnishings, and rich textures. This design style embodies the warm and casual lifestyle of Europe’s Southern coast especially the south of France, Spain, and Italy. It also draws inspiration from other countries and cultures like northern Africa and western Asia. Each of these regions has its own unique offerings. However, they share many common design features which the whole world admires. Mediterranean interiors bring the vibrant landscape and warm sunlight into the interior. This gives a truly carefree and casual feeling to the interiors. The Mediterranean design has a classic charm and seductive beauty which is difficult to find in any other design style. More and more people are incorporating this relaxed style into their homes whether it is a Mediterranean living room design or a bedroom decorated with southern European influences. Mediterranean style, however, can be tricky to get right. Too many elements or the wrong pieces can come across as tacky or gaudy. However, too little elements will not make an impact. It is essential to create a balanced layout. Generally, Greek, Italian, and Spanish influences are pretty dominant in Mediterranean homes. However, you can also introduce the regional touches of Western Asia or Northern Africa in your designs. This style’s main features are earthy, oceanic colors, natural materials, textures, patterns, and an open, airy layout. Mediterranean interiors usually feature mosaic or terra cotta tile designs, rustic finishes, traditional furnishings, and wrought iron hardware. You don’t need to be located in these coastal regions to get a Mediterranean design in your homes. Our collection of these ten Mediterranean living room design has plenty of inspiration to get you started. White brings brightness as well as a sense of calm to any decor. The abundant white in this living room also brings in light, peace, and serenity. You can see Mediterranean influences in the vaulted ceilings, weathered walls, large terra cotta vases, ornamental chairs, and a beautiful gold-base glass table. Similarly, the flowery chandelier with golden petals adds to the Mediterranean look. However, the white curtains, modern furnishings, and the plush daybed give the room a modern look. The area rug and fireplace bring warmth while the flowers and art bring colors to the sterile design. The Mediterranean architecture reflects continuity between the indoors and outdoors. Similarly, Mediterranean designs like this living room, are often open, light, and airy to emphasize the connection to the outdoors. The stucco ceiling and tiled floors too are typical of this design style. The pops of blue in the furnishings add color to the earthy decor. The industrial light fixtures like the chandelier and floor lamps give the room a modern touch. The simple and functional furniture is typical of the Scandinavian design style but also serves the purpose in this functional living room design. This Mediterranean living room design is a symphony in blue and wood tones, brightened by the yellow Jaisalmer floor. Floor-to-ceiling glass panels open the home out to the north and east and allow generous views of the landscaped garden. The room is accessorized with a pair of horse busts that go well with the earthy color scheme and form a compelling focal point. A beautifully vaulted and lit ceiling draws the eye upwards. The vintage decor items like the huge watch and lighting fixtures add an authentic touch to the decor. The golden lights give the whole room a cozy yet luxurious appeal. The main feature of Mediterranean style is how they bring nature inside the home. Each element is carefully chosen to blend the interior with the exterior. The soothing color palette of this Mediterranean living room design is derived from the colors of the sea and sky. The fresh colors and organic fabrics also give the room a Mediterranean look. The beautifully patterned area rug resembles the tiled floors and further enhances the design. The bright blue sky and water in the wall art bring color to the design. The transparent coffee table and stunning chandelier give the room a modern touch. The many shades of brown and blue in this room come together to form a beautiful contrast. Earthy shades of brown on the sofa and coffee table as well as the vaulted ceilings bring warmth and comfort to the decor. In contrast, the blue tones bring color to the decor. The blue tones also resemble the sea and bring a soothing and calm feel to the decor. Vaulted ceilings and ornamental decor like the vintage chandelier are typical features of the Mediterranean style. The key feature in Mediterranean style rooms is stucco walls and terra-cotta tile or stone floors. Also common are architectural features such as repeating arches and barrel-vaulted ceilings. This living room has a vaulted ceiling and many repeating arches in its design. The ornate furniture is also typical of Mediterranean living room design. The soothing colors of soft blue and light grey give the room a bright and calm look. The serene and calm feel of this comfortable living room is certainly very relaxing. The earthy tones of this living room decor certainly give the room a warm and welcoming feel. Bright pops of color add interest and contrast to the decor. The Mediterranean style uses a lot of natural elements as seen in the wooden vaulted ceiling, the stone fireplace and wooden arches of the window frame. The oriental rugs and wall tapestry bring colors to the decor and also indicate a Greek touch to the decor. Exposed wooden beams, stone floors, and stone arches form this Mediterranean living room design. The simple architecture of this room indicates a Mediterranean style. The bright brown tones of the furnishings further add to the same look. The iron railings and light fixtures also indicate the Mediterranean touch. The vibrant colors and warmth of this decor are typical of any Mediterranean design. The simple layout of this living room certainly makes it look spacious and bright. 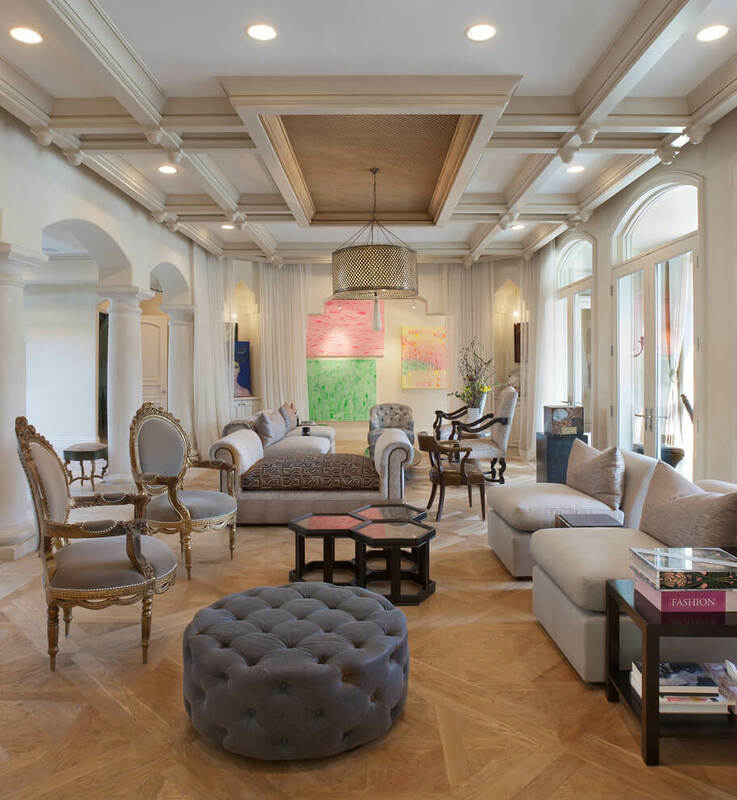 Light colored walls and white stucco ceilings bring brightness to the decor. The tiled flooring and arched windows also give the room a Mediterranean touch. The oriental rug and Moroccan ottoman further add to the Mediterranean look. The leather sofa and wooden furnishings add contrast as well as character to the decor. The vibrant colors, authentic vintage decor, colored glass windows, and tiled floors all indicate a Mediterranean design. The comfortable furnishings and wooden furniture bring warmth to the decor. They also make the room look interesting. The glass windows bring visual interest, colors, and pattern into the decor. The hanging pot of plants gives the room a fresh and lively ambiance.